Rally for Rivers – A Model for a Global Ecological Movement? Rally for Rivers is being examined in earnest by the state and central governments in India. Meanwhile, it is also being seen by global leaders as a model ecological movement. After a remarkable awareness campaign that brought 160 million people together, Rally for Rivers has taken many notable strides towards making the policy recommendations a ground reality. After millions of Indians responded with their concern about the desperate state of our lifelines and what has to be done to restore them, the state and union governments have responded as well. Six states – Karnataka, Maharashtra, Gujarat, Punjab, Assam and Chhattisgarh – have signed Memorandums of Understanding with Isha Foundation for river revitalization as a peoples’ movement. On-ground project planning has commenced in Maharashtra. The Niti Aayog has set up a committee under its CEO to examine the Rally for Rivers policy proposal. And Rally for Rivers now has a Board! The board members are an illustrious group – Justice Arijit Pasayat, retired Supreme Court Judge, Ms. Kiran Mazumdar-Shaw, Chairperson & Managing Director of Biocon, Mr. Ravi Singh, Secretary General & CEO of World Wildlife Fund-India, Mr. Shashi Shekhar, IAS, who retired in December 2016, as Secretary in the Ministry of Water Resources, River Development & Ganga Rejuvenation, Government of India; and Mr. Pravesh Sharma, IAS, who last served as MD of Small Farmer’s Agribusiness Consortium in the Ministry of Agriculture, Government of India. This Board will interface with Government at different levels and other stakeholders such as the industries, farmers, voluntary organizations etc. And now, the rest of the world is taking notice too. 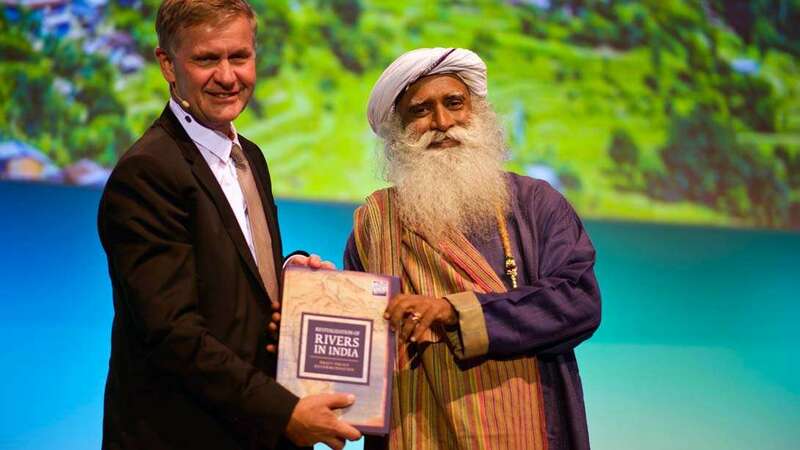 Sadhguru was recently invited to the Global Landscapes Forum (GLF) to address an elite international audience in a discussion with Erik Solheim, the Executive Director of UN Environment. Rally for Rivers was the topic of discussion. Special focus was placed on its success as a mass ecological movement, and as an example for other nations in involving the public in ecological concerns. The thousand-strong audience that attended the event consisted of the heads of nations, environmentalists, ecologists, policy-makers and other nation-builders and influencers from around the world. GLF is the world’s largest science-led platform on sustainable land use. It is led by the Center of International Forestry Research (CIFOR) alongside founding partners UN Environment (formerly UNEP) and the World Bank, with core funding provided by the German government. The Global Landscapes Forum accelerates action towards the creation of more resilient, equitable, profitable, productive and healthy landscapes and the achievement of the UNFCCC Paris Agreement and Sustainable Development Goals (Agenda 2030). The 2017 GLF conference took place in Bonn, Germany on December 19. Other points that Sadhguru brought up were about converting filth to wealth, so that wastewater is treated and utilized for irrigation. Sadhguru also stressed on the need to remove taxation on Farmer Producer Organizations, and how local communities should be allowed to participate and also protect the forests they depend on. The discussion was very well-received by all present, who lauded the efforts of Rally for Rivers, which they hoped can be a model for a global ecological movement. The Director General of CIFOR, Robert Nasi, sent a letter thanking Sadhguru for his participation in GLF and appreciating his insights. “The impact of your involvement cannot be understated,” said Mr. Nasi. A very succinct and appropriate encapsulation of Sadhguru’s and Rally for Rivers’ impact!